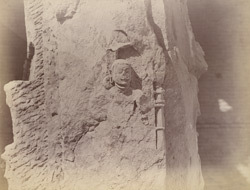 Photograph of a sculptured head on a pillar from the Rudra Mahalaya Temple at Siddhapur, taken by Henry Cousens in the 1880s. Siddhapur is located 64 miles north of Ahmedabad in northern Gujarat. This temple, dedicated to Shiva, was erected when the Solanki dynasty ruled Gujarat in the 12th Century. It was once an imposing multi-storey temple, built of very large stones however few of these remain today. Much of the temple was destroyed by Alau'd-din Khuni in the early 14th Century and parts were turned into a Jami Masjid. The ornamentation was very elaborate and exuberant however as can be seen in this photograph it is now badly worn.